A day to say thank you God for the gift of life on our planet. On May 26, as part of the Global Community Peace Movement, we rejoice with all Peoples of the world , and all life, for the annual Celebration of Life Day. Life is the most precious gift ever given by God to the universe and this event needs to be celebrated. On August 22 of every year the Global Community celebrates the Global Cultural Day, the Cultural Appreciation Day. The event's theme is "Culture, Values and Social Development." The Global Community is rich with tradition and art. Culture is certainly tangible - churches, temples and monuments; and intangible - heritage with performing arts, fine arts or visual arts. Every community is based on a society distinctly different from any other country and its people. The Cultural Appreciation Day celebration occurs at the same time and is an important part of the Global Exhibition. And October 29 of every year is a special day to claim that right. Let us celebrate! The Earth and all its natural resources belong to all the "global communities" contained therein. A village, or a city is "a global community" and owns the land and all other natural resources around its boundaries. Along with the Global Community, all life on Earth, and the Soul of Humanity, a global community has ownership of all natural resources within its boundaries. Founders and Spiritual Leaders of the Global Community organization are happy to celebrate that day with all life on Earth. 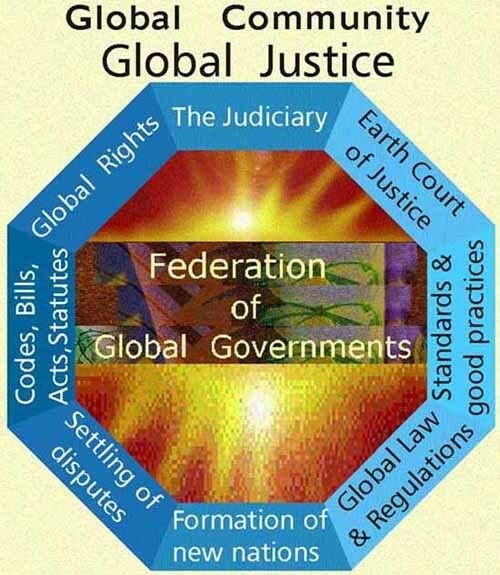 The Global Community organization, Earth Government and the Federation of Global Governments were founded on October 29, 1985, in Calgary, Canada by Germain Dufour, Prophete of God, Spiritual Leader and President, and further developed through Global Parliament meetings. Later on in 1990s he was joined by his wife, Virginie, in the developing of many global concepts. Symbiotical relationships were defined to show the path for a better world. The Federation was formed to replace the United Nations. Its basic proposal is a de-centralized global government. A Global Government offers essential services to the people where it operates and the Federation main function is to serve all people and help in this process with the formation of Global Ministries to protect all life on our planet. Essential services to the people of each member nation are now the most important global rights on the Scale of Global Rights and are protected by the Global Protection Agency (GPA) of each member nation whose function is to enforce Global Law as defined in the Global Constitution. The Scale is the fundamental guide to Global Law which itself includes legislation covering all essential aspects of human activities. That is how we will bring about the event of Peace amongst us all and give security to all people, all life on Earth. Citizenship of the Global Community, which will exist by virtue of a Treaty between nation governments and the Global Constitution of the Global Community, is conferred on everyone who is a citizen of a Member State. And October 29 of every year is a special day to participate in the ceremonies of those becoming Global Citizens. The Global Community citizenship is additional to, and does not replace, national citizenship. Election by universal suffrage when conducted by all Member States, will give the Global Community Parliament full legitimacy. By voting in its elections the citizens of the Global Community enhance its status and influence. You may be eligible to become a citizen of the Global Community. The Global Community Citizenship is given to anyone who accepts the Criteria of the Global Community Citizenship as a way of life . It is time now to take the oath of global community citizenship. We all belong to this greater whole, the Earth, the only known place in the universe we can call our home. A very important legislation is the Global Citizens Rights, Responsibility and Accountability Act which, after its approval by Global Parliament, will define rights, responsibility and accountability of all global citizens. Each and everyone of us will make decisions, deal with one another, and basically conduct our actions as per the Act. The final document was brought forward for approval during the Tenth Global Meeting of the Global Community Earth Government , Fall 2006. People from all nations of the world, and all National Governments, are invited to amend the proposed document (see Press Release Feb. 26, 2006 ). Before you make your decision, we are asking you to read very carefully the Criteria of the Global Community Citizenship, make sure you understand every part of the criteria, and then make the oath of belonging to the Global Community, the human family, Earth Community and Earth Government. You do not need to let go the citizenship you already have. No! You can still be a citizen of any nation on Earth. The nation you belong to can be called 'a global community'. But you are a better human being as you belong also to the Global Community, and you have now higher values to live a life, to sustain yourself and all life on the planet. You have become a person with a heart, a mind and Soul of the same as that of the Global Community. The Global Community welcomes you! Tribute to Virginie Dufour, the first Secretary General of the Global Community organization, who passed away April 28,2000. The Global Community thanks you Virginie with all their hearts. Our members will keep your Vision alive and continue to work to create a better world. We will miss your guidance and enlightenment in each step that we’ll take in the coming months and years. Our remembrance of you will be eternal. You have been an inspiration for the world and will be sorely missed by the thousands of lives you touched. Your work will remain a guiding hand for the Global Community. May God rest your Soul in eternal peace. For the fourth year since the first time ever promoting of a Global Exhibition in 2006, there will be a Global Exhibition at the time of Global Dialogue 2009, and at the same site in Nanaimo. It will also be occurring anywhere else in the world along with Global Dialogue 2009 during the period August 17-22 of each year. The Global Exhibition is a replacement to the usual Trade Show we have been promoting during each previous Global Dialogue. 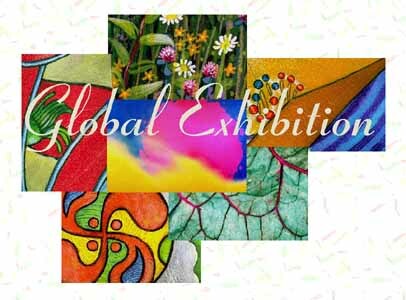 The Preliminary Program to the Global Exhibition will be the same as that of Global Dialogue 2009. The Global Exhibition must allow multiplicity, diversity and contradiction to exist inside the structure of an exhibition ... a world where the conflicts of globalization are met by the romantic dreams of a new modernity, a federation of nations, the Federation of Global Governments. As defined by the Global Community, the concept of ownership states that land and natural resources of the planet are a common heritage and belong equally to everyone, to all life on Earth, as a birthright. Products and services created by individuals are properly viewed as private property. Products and services created by groups of individuals are properly viewed as collective property. Only the Global Community can rightfully claim ownership of the Earth. October 29 is the day to celebrate ownership of our natural resources. Along with ownership comes the obligation of using the resources, share them or lose them. Land and all other Earth natural resources are not commodities. Use the land, share it or lose it. This principle also applies to banks and similar institutions all over the world and to Wall Street. You own property because the previous owners could not pay. Use that property, share it or lose it. The Global Community stipulates that land ownership is no longer a problem. The Earth and all its natural resources belong to all the "global communities" contained therein. A village, or a city is "a global community" and owns the land around its boundaries. Along with the Global Community, it has ownership of all natural resources within its boundaries. So, by definition, land here, covers all naturally occurring resources like surface land, the air, minerals deposits (gold, oil and gas etc), water, electromagnetic spectrum, the trees, fish in the seas and rivers. It is unjust to treat land as private property. As mentioned above, land here, by definition, covers all naturally occurring resources like surface land, minerals deposits (gold, oil and gas etc), water, electromagnetic spectrum, the trees, fish in the seas and rivers. It is unjust to treat land as private property. Land is not a product of labour. Everyone should therefore be given equal access to such natural resources. Nationalization is a necessity because American corporations have been buying local corporations to acquire natural resources of a country. This state of affairs has been going on ever since WWII. Over the past decades, the US national debt and annual deficit have been out-of-control because of a complete business freedom of the US corporate world. No taxation! When a large corporation is about to go out of business, the White House intervened with a bail out. For example in Canada, the property of the hydrocarbons, the oil and natural gas, and tarsands, have mostly owned by American and other foreign corporations. Our natural resources have been bought out by foreigners. Pipelines have been built to transport the oil and natural gas to the customers in the United States without paying taxes to Canada. Canadian corporations that have been taken over by American corporations with bankrupted money, paper money, Stock Exchange money, money that Americans dont even have. The White House prints dollar bills by the trillions and give them to corporations to buy more Canadian corporations. This is no longer a fair exchange of something tangible with something else of an equivalent value. We have natural resources and Americans have bankrupted money to exchange with. That's not right! How can we let that happened? It is time to nationalize Canadian natural resources. Nationalization is not new. The global financial crisis is good example of nationalization. When Wall Street started to crash, the US Government thought it would be wise to nationalize key financial institutions, even partially nationalized, so why not natural resources? They are in great danger of being destroyed (forests, oceans, fresh water, soils, air we breath, electromagnetic spectrum) or destroying all life on Earth (petroleum rersources). Once Canadians have recovered these natural resources, it will generate employment. The plundering of our natural resources by international and transnational oil and gas companies has come to an end. And for this reason we want to share the joy on this historic day of nationalization. If indeed previous governments have used the Armed Forces for the benefit of transnational corporations, the Armed Forces can now be used to unite for their country, for their nation, for their patria. We are a government of the people, a native government. We are a global community. We want to ask government to defend its sovereignty, its dignity and above all the integrity of its territory, we want to ask that it take charge of all the oil fields of all of its nation. Unless a reformed or empowered Global Community is leading firmly upon the principle of equal rights for all Global Citizens, then the planet will be controlled by a handful of vested interests. Land is not a product of labour. Everyone should therefore be given equal access to natural resources. The Global Economic Model proposes to make private property the product of labour. Common property is all what Nature offers. The Global Economic Model policy removes taxes from wages and increases taxes and user fees on common property. 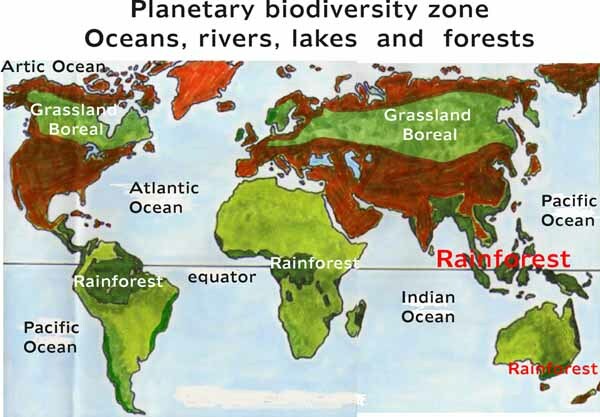 The Global Community has established a planetary biodiversity zone now under the protection of the Global Protection Agency (GPA). We have declared a moratorium on all development in the zone, including all drilling, military testing, and any other destructive uses of the ecosystems. Our planet is populated with living beings consisting of millions of different life forms interacting with each other to survive, thus forming an intricate web of life in different ecosystems on the planet. The interaction and interdependence between life forms are the driving force that creates and maintains an ecological - environmental equilibrium that has sustained life on Earth for millions of years enabling it to evolve, flourish and diversify. The Global Community values Earth’s diversity in all its forms, the non-human as well as the human. On Earth’s surface exists a diversity of arctic, temperate and tropical ecosystems with many different varieties of plants, animals, and human beings, all of which are dependent on soils, waters and local climates. Biodiversity, the diversity of organisms, depends on maintenance of ecodiversity, the diversity of ecosystems. Cultural diversity – which in effect is a form of biodiversity – is the historical result of humans fitting their activities, thoughts and language to specific geographic ecosystems. Therefore, whatever degrades and destroys ecosystems is both a biological and a cultural source. Earth is mostly covered with oceans. Though generally recognized as several 'separate' oceans, these waters comprise one global, interconnected body of salt water forming the Global Ocean. This concept of a global ocean as a continuous body of water with relatively free interchange among its parts is of fundamental importance to the Global Community. The major oceanic divisions are defined in part by the continents, and various archipelagos. These divisions are the Pacific Ocean, the Atlantic Ocean, the Indian Ocean, the Southern Ocean (which is sometimes subsumed as the southern portions of the Pacific, Atlantic, and Indian Oceans), and the Arctic Ocean (which is sometimes considered a sea of the Atlantic). The Pacific and Atlantic may be further subdivided by the equator into northerly and southerly portions. Smaller regions of the oceans are called seas, gulfs, bays and other names. There are also some smaller bodies of saltwater that are on land and not interconnected with the Global Ocean, such as the Aral Sea, and the Great Salt Lake – though they may be referred to as 'seas', they are actually salt lakes. Despite their huge size, the oceans have been greatly affected by human activity. Pollution and overfishing are two major concerns. Human activities affect all aspects of life to the point of extinction of most species on our planet. In April 2008 the Global Community Peace Movement has declared a planetary state of emergency. 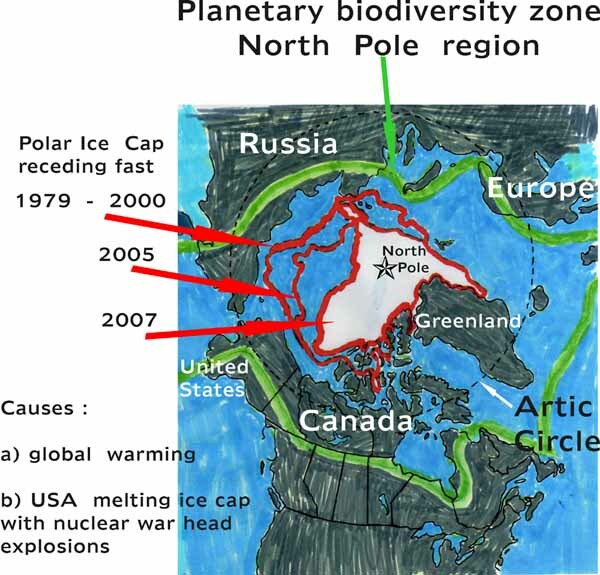 For that reason, on September 25, 2008, the Global Community has declared a moratorium on all development in the zone, including all drilling, military testing, and any other destructive uses of the ecosystems. We have declared a moratorium on all development in the zone. On May 26 of each year, along with the Celebration of Life day, the Global Community celebrates the Global Peace Mouvement Day. The Global Peace Mouvement is about the courage to live a life in a harmonious peace order and showing by example, thus preventing poverty, wars, terror and violence. We need to educate the coming generations with good principles, being compassionate, social harmony and global sustainability being some of them. The responsibility of a peacemaker is to settle differences through compromise and negotiation before they erupt into violence. Conflicting views do not have to bring about fighting. War is an irreversible solution to a problem. War is never an appropriate solution to resolve a conflict. In order to bring about the event of peace, the Global Community is offering other good organizations around the world to work together to bring warring parties to peace. Peace in the world and the survival and protection of all life on our planet go hand-in-hand. Asking for peace in the world means doing whatever is necessary to protect life on our planet. Protecting life implies bringing about the event of peace in the world. Let our time be a time remembered for a new respect for life, our determination to achieve sustainability, and our need for global justice and peace. Our first objective was to find statements from all religions, all faiths, that promote ethical and moral responsibility to life and a responsible Earth management. This was assumed to work well within the context of the global civilization of the 3rd Millennium and after defining the Global Community criteria of symbiotical relationships. In this context, we have defined that any symbiotical relationship is for the good of all. It is based on a genuine group concern and unconditional support for the individual's well-being ~ a giant leap in human behaviour. Symbiotical relationships are needed today for the long term future of humanity, for the protection of life on our planet, and to bring about the event of peace amongst us all. The very first step of the Federation, and maybe the only one for several decades ahead of us, is the approval of essential services amongst the participating member nations. To that effect, new global ministries will be established to guide us onto the path of global sustainability. Through these new global ministries, we want each Global Government to take a larger share of responsibility of the specific region where it operates, and be more accountable to the people of that region. Be compassionate. Essential services to the people of each member nation are now the most important global rights on the Scale of Global Rights and are protected by the Global Protection Agency (GPA) of each member nation. The GPA will train and lead a global force, bypassing traditional peacekeeping and military bodies such as the United Nations and NATO. The GPA is a short term solution, an immediate and efficient response to help. The GPA will enforce the law. And that is a long term solution to the planetary state of emergency. And that is also how we can solve the global problems facing this generation, thus largely improving the quality of life of the next generations, and that is how we will bring about the event of peace amongst us all. The Global Justice for all Life Day is on October 29 of each year. It is a time to get together and promote Justice for all life on our planet. 8. 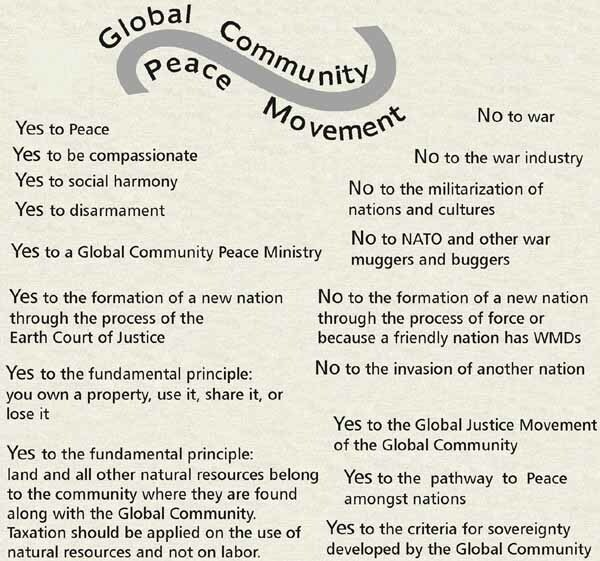 The Global Peace Movement is about educating ourselves to engage in personal diplomacy in another country. We are given opportunities to meet and listen to some of the leading authorities on such subjects as humanitarian and volunteerism, education, politics, historical, social and cultural perspectives, conflict management, teamwork, world affairs, community involvement, and religion. On May 26 of each year, along with the Celebration of Life Day and the Global Peace Mouvement Day, the Global Community celebrates the Global Disarmament Day	. The USA is invading the world, and the UN can do nothing to stop them. The USA was allowed to invade other nations, change their governments, and has often made lies in speeches to the UN, to the world. Remember what the US representatives told the world at the UN prior to the invasion of Iraq? Lies! All lies! And the leadership of the UN never did anything to reprimand the US representatives and implement hard sanctions for the invasion of Iraq. Ever since the partitioning of Palestine by the UN in 1947, the USA have given Israel enough WMDs, including nuclear war heads, to destroy the entire Middle East region and no sanctions were ever enforced against Israel and the USA. Where was the UN leadership? What has the UN done to stop the invasion? Nothing! The UN has never done anything to help humanity. And that is a crime against humanity. To do nothing is a crime against humanity and all life on Earth. To facilitate the work done on climate change by scientists was OK. The UN should facilitate other worthy causes and conferences. But the work done by those scientists was not done by the UN. The UN have not spent a penny for the work done by scientists. It just seems that the UN is getting credit for a work it has not done. 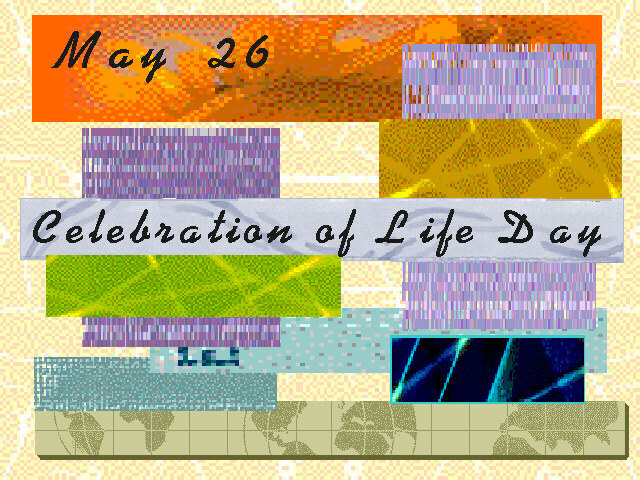 Because the Soul of Humanity's primary goal is the formation of life in the universe, we celebrate the Soul each day and especially during the Life Day Celebration on May 26 of every year. It is commonly believed that a Soul comes into existence at the same time as the body and that, as the body grows older, the Soul may be defined as a person's strong, deeply felt	thought, action, and emotion, which may or may not be of moral nature, and which may be concerned with language, social customs, religion, and music. But this is not my view. My own teaching of the Soul begun a few years ago. The above work of art represents the solar system and its Souls. Of course this is only an artwork. 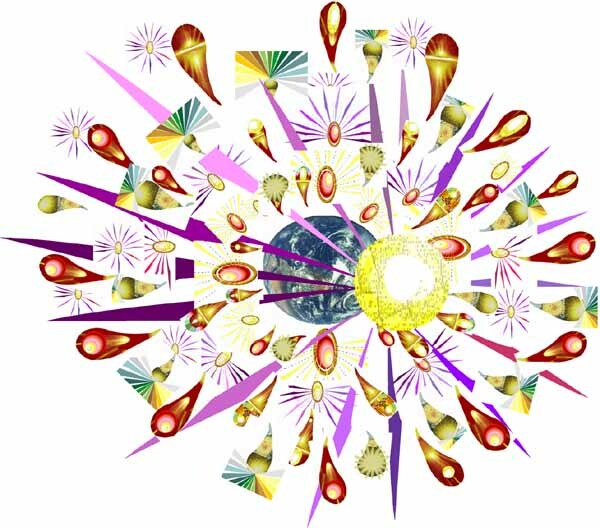 It was created to explain my concept of the Soul of a modern symbiosis global society. A photo of the Earth is shown here with the Soul of the Sun illuminating the planets. Souls exist everywhere in the system and representatives are being shown as individual bundles of light of all shapes, sizes, colors and intensities. Souls are everywhere in all matter, all packed together, yet all different from one another. One of the most powerful characteristics of Souls is that they can merge with one another. Souls that merged become a different Soul. Constant merging makes its easy for Souls to move around and achieve their ultimate common goal. They have a fluid type of motion and move around as waves and the wind, swirls, interacting gusty winds, in and out	of each other, constantly merging to achieve the ultimate goal of the Soul. All Souls are independent living beings, and they exist together elsewhere. They don't resemble our physical forms. There is a Soul in everyone of us. The same Soul stays with us throughout our life. A Soul is a beautiful, wonderful entity who loves us completely. A Soul can have a soulmate. I do! Her physical form died a while ago but her Soul merged with mine, and we are now together forever. We are now one Soul, brighter, different, evolving, serving God and seeking God's Heaven! Souls exist in all spaces and are goal oriented. The one goal common to all Souls is to guide the matter of the universe towards the creation of life. Then life becomes conscious of God. This goal is a global common to all Souls. We could compare it to the force fields of our universe: gravitational, electromagnetic, static magnetic, electric, electrostatic, etc. Time is truly a global common for the physical universe, for all life, as we do observe the passage of time, but is not a global common for the Souls. God's Spirit is everywhere at all times, past, present and future. Other global commons amongst Souls are peace, social harmony, love, absolute communications, fluid motion, and Will of God. Although the same Soul would be within a life-form throughout its life-span, it is only a viewpoint, life's viewpoint, the physical universe's viewpoint. Past, present and future dont exist for Souls. What seems a billion years to us is only an instant, an event, a motion for a Soul. The overall picture, the Soul's viewpoint, is still a fluid type of motion and Souls move around as waves and the wind, swirls, interacting gusty winds, in and out	of each other, constantly merging to achieve the ultimate goal of the Soul. Souls exist in all particules and can have an effect on the physical universe. A Soul shows the way in whatever particule they exist in. A Soul has one very important goal, and it is to show the way toward the creation of life in the universe. That is why I referred to them as 'Guiding Souls'. Since time has no meaning to a Soul, the billions of years that it takes to create galaxies, planets, and ultimately life, can always be achieved. Like an artist painting the universe making sure that, at the end, life is expressed on the canvas. Life is the ultimate goal to achieve. Life is the way God has chosen for the physical universe to be conscious of God. A life-form with more physical senses has more ways to communicate with the Soul and thus with God. The Soul of all Life or Soul of Humanity is a wonderful loving Being made up of the Souls of all lifeforms on Earth and the Soul of Earth itself. This is what Souls do best, to unify and better serve God. They have merged together to better serve God. Souls can evolve as well, and they have. They have formed a new Being, the Soul of all Life, also called the Soul of Humanity, to better serve God. The Soul of Humanity is helping to bring about the event of Peace in the world. Knowing that Earth is a spiritual entity as well as a physical entity in space and time in the universe we begin to have a better relationship with Earth and with all its living inhabitants. This way Earth management will become a spiritual and a natural process whereby each person is responsible and accountable for its management the best they can. Peace in the world and Earth management have for far too long been in the hands of and affected by government and business leaders, in the hands of a few people on the planet, as opposed to being in the hands of all of us working together to keep our planet healthy. We are the keepers of the Earth. The Global Community has begun to establish the existence of the age of symbiotical relationships and global cooperation. In the context of the global civilization of the 3rd Millennium, we have defined that any symbiotical relationship is for the good of all, for the good of the 'other'. It is based on a genuine group concern and unconditional support for the individual's well-being ~ a giant leap in human behaviour. The question is how can we improve the political symbiotical relationship to fulfill the fundamental criteria? The Global Community promotes the values and principles to achieve the fundamental criteria and that requires the promoting and establishment of: global community ethics, mutual respect, respect for life, basic liberties, justice and equity, caring for the 'other', integrity, responsibility and accountability. The laws of nature can organize matter to build complex biochemical systems that are at the origin of lifeforms such as a complex human being. The most relevant laws are: biological reproduction, natural selection and mutation. And each particle of matter has a Guiding Soul. All biological structures can be explained in terms of those natural laws and the Guiding Souls serving God. The existence of Souls does not necessarily imply a special beginning of the universe. The universe may have never had a beginning and probably never did. Souls can only guide the matter of the universe to serve God. Observations of the universe show the stars in our galaxy, galaxies, clusters of galaxies, super clusters of galaxies, and many other special objects. A theory of the observable universe that has stood out over the past decades is the Big Bang theory. Different types of data point at the Big Bang theory. We may never be a 100% certain which theory of the universe (and God knows there are many) is correct. Even if the Big Bang was correct, it could also be that the observable universe is a part of an even larger, infinite, universe. That is more likely to be true. God is infinite in space and time and could have created our observable universe for a higher purpose. Let us assume here that the beginning of our observable	universe was a Big Bang. The conditions for the formation of life on Earth appeared gradually over the past billion years. Souls were guiding the expansion of the universe and evolution of life in small ways so as to make it possible for life to evolve and be conscious of God. Now imagine a large cloud of dust particles and each particle has a Guiding Soul. As the cloud becomes a Star and planets, Souls start merging together. The star itself, like our Sun, becomes a single, unique Soul serving God. The Sun spreads its light, its energy all around, DIVINE LOVE and DIVINE WILL, helping life to be created on Earth. Earth itself also became one unique Soul to better serve God. At the early stage of this expanding universe, every particle in the universe had a Soul each being a small part of the primeval consciousness of God. Each Soul was the essence of a small part of God's Spirit. In a way, the essence of each Soul is its own Spirit, itself a small part of God's Spirit. This is because God exists everywhere in the universe and in every particle of all galaxies. Souls have an important intrinsic quality, they can merge together, a group of Souls can become one Soul, a brighter one, different. This is what Souls do best, and it is to unify to better serve God. Souls can evolve as well. A Soul's primary goal is to serve God. A Soul can affect matter to some extent so as to achieve God's Will. Guiding Souls guided the evolutionary process in small ways. Many groupings of Souls became more complex than others as they were much brighter beings than other groupings, but all serve God in their own special way. One unique and most wonderful grouping was the grouping that made the Human Soul. God loves the human Souls a lot because of their wonderful qualities. Through their Souls human beings became conscious of God in many different ways. Religions of all kinds started to spread on Earth over the past thousands of years to adore God and pray. Different groupings of Souls affected human beings in different ways and Peoples today have different religious beliefs. God is like a river feeding plentifully and bountifully all life and plants. There are many pathways leading to the river. They are God's pathways. God loves diversity in Nature and in Souls. God loves good Souls from all religions. There are other pathways for Souls to enter God's Heaven but they are God's pathways. * enter God’s Heaven, God's Spirit, God's Pure Light, God's universal mind and global consciousness. Life exists on millions of other planets in the universe, and our species got to be who we are today through the evolutionary process just described. Other lifeforms in the universe may have evolved to be at least as advanced as our species. Their Guiding Souls may even be more complicated than ours. They may have merged a trillion times more than our Souls. They may have evolved as well.